It's been a rubbish day today, bloody miserable, so I've gone for some blue -- Superdrug MUA Shade 1. 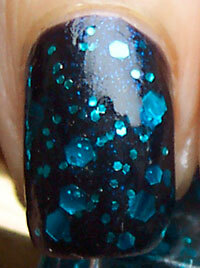 It's a very dark blue with a rather glorious shimmer to it, mmmm. 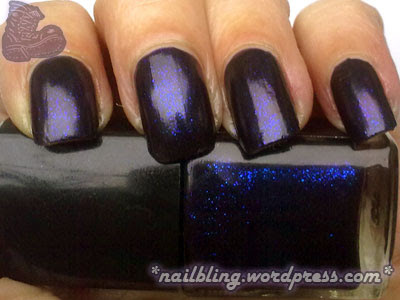 I did actually want to wear some Deborah Lippmann Across the Universe but I didn't have any. I did, however, have an empty nail varnish bottle so I made some frankenpolish out of the MUA Shade 1 by adding some blue glitter polish to it (beauties_salon on eBay sells it). I've named the frankenpolish Across the Universal Studios Car Park. Across The Universal Studios Car Park Nail Bling. It's like having loads of little blue ultra-brite LEDs in my nails, but these aren't quite as dazzling and they don't use electricity. They're so bright that sailors could probably use my nail bling to navigate their way home. This frankenpolish certainly made my camera go a bit funny, it doesn't seem able to cope with all the shinyness and makes everything look clumpy and awkard when it looks well blingtastic in real life. I had to dig out my turn-of-the-century Kodak awful-cam to get the blurry picture on the left as the phone-cam could not hack it. Seriously need to invest in a half-decent camera at some point, just need to stop buying plugs and polish and plates and posh coffee for a while. Thanks :) They are gorgeous -- I liked them both so much that I kept them on for three days, which is some sort of record for me. 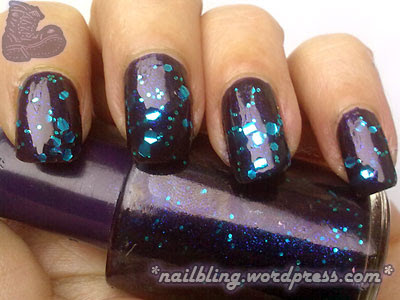 Holo and Glitter and Duochrome, HAHA!